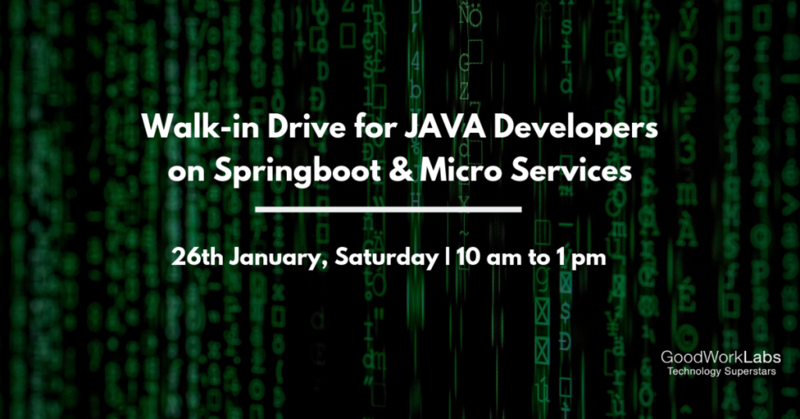 GoodWorkLabs is conducting a massive walk-in drive on Saturday, 26th January between 10 am and 1 pm. We are specifically looking for Java Developers who have a working experience of Spring boot and Microservices and has good knowledge of data structures, distributed systems, and algorithms. Venue: GoodWorkLabs, 4th floor, Akshay Tech Park, EPIP Zone, Whitefield, Bangalore – 560066. GoodWorkLabs is one of the fastest growing technology companies in India and is also a Google Certified Agency. We have been ranked as the 3rd Fastest Growing Technology Company by Financial Times in 2018. Right from Startups to Fortune 500 companies, the best of the brands have trusted GoodWorkLabs for all their technology requirements. If you join GoodWorkLabs, you will get the opportunity to accelerate your career to the next level. You will get hands-on experience in working with top clients and will also work on the latest trending technologies.